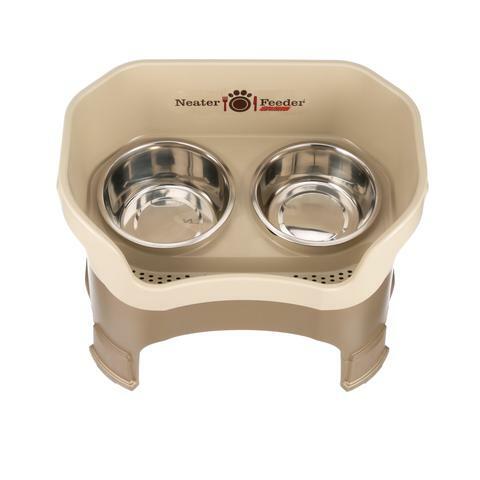 Neater Feeder The Neater Feeder is designed with protective walls to contain splashes and spills from an inadvertent kick or an excited pet. This revolutionary system holds spilled food in an upper reservoir while spilled water flows down a gentle slope through a filtering system and drains into a lower reservoir that can safely contain more than an entire bowl of spilled water, keeping it off the floor until you are ready to dispose of it. Keeping spilled water off the floor prevents floor damage and saves clean up time! Keeping the spilled food in the upper reservoir, off the floor, not only saves you work, but also keeps it clean for reuse.